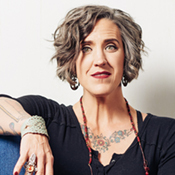 Join us for a reception and reading with visiting author Nadia Bolz-Weber. We'll provide drinks and snacks, and Tattered Cover will be on-site to sell books, which you can have signed. A suggested $5 dollar donation for food and drink is appreciated. Check out Bolz-Weber's craft talk preceding the reception: Sinner and Saint—Using Spiritual and Religious Texts in Writing.